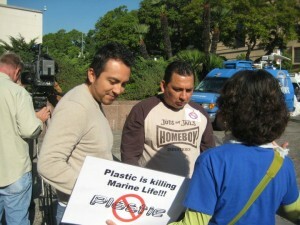 Latinos at Forefront of Largest Plastic Bag Ban in U.S. Believing that everyone deserves to live in clean, healthy communities free of plastic bag pollution, Latino leaders in the local community joined a broad coalition of workers, environmental groups, grocers, celebrities, and elected officials that called for Los Angeles County authorities to ban plastic bags and promote the manufacture of reusable bags for their use at the grocery stores instead. LOS ANGELES — Parts of Los Angeles County have joined other California communities in banning stores from using single-use plastic bags. County supervisors approved the measure 3-1 on Tuesday [Nov. 16] in hopes of preventing billions of bags from polluting neighborhoods and waterways. It bans stores from giving customers single-use plastic bags and would require them to charge 10 cents for each paper bag. The ordinance, which goes into effect next year, would apply to unincorporated parts of the county where an estimated 1.1 million people live. It does not include the 88 cities within the county, such as the city of Los Angeles, which is apparently looking at the county’s findings to craft its own proposed ban. It’s likely to be the largest plastic bag ban to hit the US yet — enacted in parts of the sprawling LA county, disposable, single-use bags will now be off limits to 1.1 million people. In addition, paper bags will now cost 10 cents a pop for shoppers — providing yet another incentive for southern Californians to start adopting reusable bags. For more information on the ban, visit Heal the Bay’s website here. To read the ongoing coverage that Project Economic Refugee had been giving to the problem of plastic bag pollution in Southern California prior to this vote, click here to access that archive. This entry was posted in California and tagged ban, environment, Latinos, Los Angeles County, plastic bags, plastic industry, reusable bags, vote. Bookmark the permalink.